The global warming process may be even more intense than originally forecast unless deforestation can be halted, especially in the tropical regions. This warning has been published in Nature Communications by an international group of scientists. 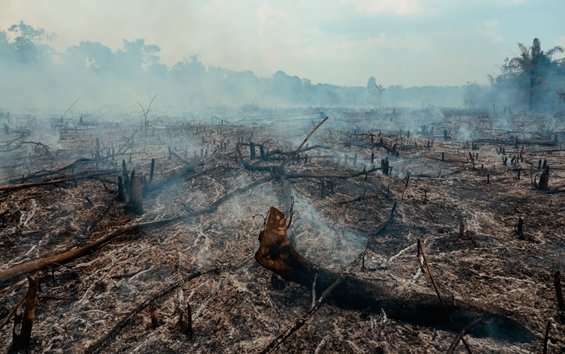 "If we go on destroying forests at the current pace—some 7,000 km² per year in the case of Amazonia—in three to four decades, we'll have a massive accumulated loss. This will intensify global warming regardless of all efforts to reduce greenhouse gas emissions," said Paulo Artaxo, a professor at the University of São Paulo's Physics Institute (IF-USP). The group reached the conclusion after conducting a mathematical reproduction of the planet's current atmospheric conditions through computer modeling that used a numerical model of the atmosphere developed by the Met Office, the UK's national meteorological service. The model included meteorological factors like levels of aerosols, anthropogenic and biogenic volatile organic compounds (VOCs), ozone, carbon dioxide, methane, and other items that influence global temperature—the surface albedo among them. Albedo is a measure of the reflectivity of a surface. The albedo effect, when applied to Earth, is a measure of how much of the sun's energy is reflected back into space. The fraction absorbed changes according to the type of surface. The work coordinated by University of Leeds (UK) researcher Catherine Scott was also based on years of analyses and survey over the functioning of tropical and temperate forests, the gases emitted by vegetation, and their impact on climate regulation. "After adjusting the model to reproduce the current conditions of Earth's atmosphere and the rise in surface temperatures that has occurred since 1850, we ran a simulation in which the same scenario was maintained but all forests were eliminated," Artaxo said. "The result was a significant rise of 0.8 °C in mean temperature. In other words, today the planet would be almost 1 °C warmer on average if there were no more forests." The study also showed that the difference observed in the simulations was due mainly to emissions of biogenic VOCs from tropical forests. "When biogenic VOCs are oxidized, they give rise to aerosol particles that cool the climate by reflecting part of the sun's radiation back into space," Artaxo said. "Deforestation means no biogenic VOCs, no cooling, and hence future warming. This effect was not taken into account in previous modeling exercises." Temperate forests produce different VOCs with less capacity to give rise to these cooling particles, he added. The article notes that forests cover almost a third of the planet's land area, far less than before human intervention began. Huge swathes of forest in Europe, Asia, Africa and the Americas have been cleared. "It's important to note that the article doesn't address the direct and immediate impact of forest burning, such as emissions of black carbon [considered a major driver of global warming owing to its high capacity for absorbing solar radiation]. This impact exists, but it lasts only a few weeks. The article focuses on the long-term impact on temperature variation," Artaxo said. Deforestation, he stressed, affects the amount of aerosols and ozone in the atmosphere definitively, changing the atmosphere's entire radiative balance. "The urgent need to keep the world's forests standing is even clearer in light of this study. It's urgent not only to stop their destruction but also to develop large-scale reforestation policies, especially for tropical regions. Otherwise, the effort to reduce greenhouse gas emissions from fossil fuels won't make much difference," Artaxo said.